Using sesame seed butter - either store bought or homemade - is egg, nut, soy, and dairy free. 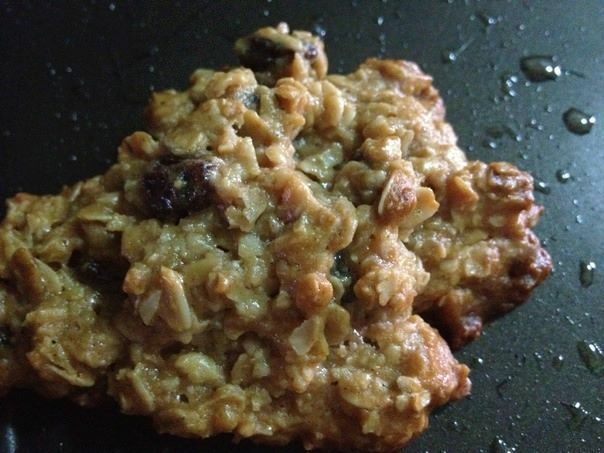 Sweetened with honey, we used organic raw, and fruit, this delicious oatmeal base cookie is exceptionally easy. Preheat your oven to 350 degrees F (175 C). Grease your cookie sheet(s). ** We over greased our cookie sheet in fear the honey would crystalize and stick. Was a mistake. It does not appear much greasing is needed in our experience **. In a medium bowl, combine the tahini, honey and cinnamon. Mix in the oats and fruit(s)/nuts until well blended. Drop by either teaspoons or tablespoons (depending on the size of cookie you wish to make) onto the greased cookie sheet. Be sure and leave between 1 1/2 to 2 inches between cookies. Bake 10-15 minutes in the preheated oven. The smaller cookies will cook quicker than the larger ones. For the smaller cookies, start at 10 minutes. When the edges of your cookies are slightly brown, they will be done. Let the cookies cool on the baking sheet for about 15 minutes before removing to your wire rack to continue cooling. ** Note, we did not transfer to a cooling rack and the cookies were fine **.